There are times when a book comes across your radar that changes your way of looking at the genre. It’s a boulder ker-plunked into the steady river of publishing and the force of its impact can be felt from anywhere you stand. Such was the reaction to Ann Leckie’s debut novel, Ancillary Justice, when it was published a year ago. To this day it has swept award season, winning the Hugo, the Nebula, the British Science Fiction Award, the Arthur C. Clarke Award and the Locus Award. 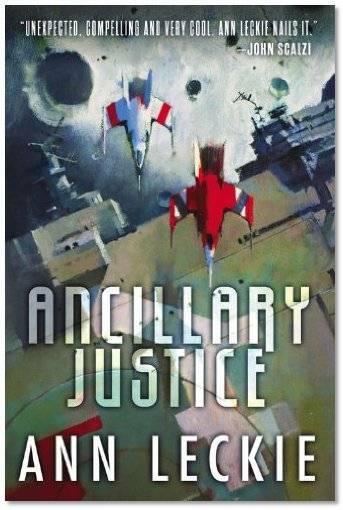 Ancillary Justice tells the story of Breq, a solider on a quest for vengeance. She used to be an artificial intelligence, Justice of Toren, simultaneously running the massive Radchaai warship of the same name, twenty ancillary units on the planet she was orbiting, as well as the singular unit the narration finds her in. But all of that is taken away from her one day due to the machinations of the Emperor of the Radch. Breq becomes stranded in a single unit, cut off from herself entirely, losing someone she held dear in the process. Breq dedicates herself to ending the life of the Emperor. Only one problem: the Emperor is spread out across one thousand different bodies and finding the true entity is a needle in a haystack in the infinite deepness of space. Ancillary Justice may have a frenzied plot full of science fiction goodness, but what Leckie also manages to do in this single novel is astounding. One of the things Ancillary Justice has become best known for is its contribution to the dialogue about gender defaulting in literature. The language of the Radch Empire and its identifiers are female dominant. So everyone is referred to using, “her,” “she,” and so on. Every character you meet, unless stated otherwise, could potentially be a woman. The use of this language not only asks the reader to completely reconsider who they’re casting in every role but forces them to examine how often they default to a male character in whatever they’re reading. And while many readers and critics are still sussing out what this means for the genre, it has helped to strengthen and continue the conversation of default gender norms in literature. I don’t know how she did it, but Leckie not only managed to discuss gender politics/norms, but she also managed to talk about a host of other issues, one of which is colonialism. The Radch Empire disperses themselves among the stars, seeking to “civilize,” any and all cultures that are not Radch. Leckie delves headfirst into what creates this mindset, as well as exploring the fallout from cultures that do not wish to be colonized. Along the way, she asks important questions on identity, family, power, sexuality and politics, while still juggling an intense narrative. On a purely structural level, Leckie does some of the best writing I’ve ever seen when exploring a narrator that exists in multiple states of perspective at once. Breq is used to existing in several dozen places at once; it’s a stark but interesting contrast to see Leckie write from Breq’s time as a multi-faceted perspective, keying in on different ancillary units, creating an intense spinning plate act that never threatens to topple; when Breq is alone, you can feel the difference as she struggles, trapped in a single unit. It is a mighty risk that Leckie pulls off brilliantly, and half the fun of Ancillary Justice is watching Leckie balance her structure in a way that’s complex but accessible. Leckie, however, is not simply a one trick pony. In addition to Ancillary Justice and its sequel, she is also the author of many works of short fiction, some in the Imperial Radch universe, and has been an editor of short fiction in the past on the magazine Gigantosaurus. Recently, she served as VP of the Science Fiction Writers of America. Ann Leckie may have appeared on everyone’s radar with Ancillary Justice, but she was a force for good in the Sf community long before then, and still is. Her writing is sophisticated, complicated, and strong; she not only explores themes of gender, colonialism, and power, but also pushes the limits of what science fiction is capable of and how it can impact our view of the world. 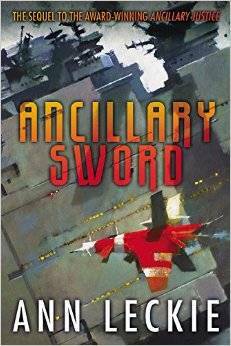 With the sequel, Ancillary Sword out now from Orbit, I’m very happy to see that it’s just as great a ride (though, I still have two hundred pages to go!). I’m beyond excited to see a future with more of Ann Leckie’s writing in it.